THANK YOU! THANK YOU!!!! again for all your comments, emails, thoughts and prayers. They have been a comfort over the last couple days. I wanted to share David's(my hubby) narration in the midst of the firestorm as it made it's way through our neighborhood. Go to our FAMILY BLOG and you can see a good map, too, to get an idea of where we were at in comparison to the actual fire line. The first comment in there is a good link for a video of what the neighborhood went through. You will see my neighbors Al and Cor on that video link. David is MY HERO! Here's is a photo of what it looked like yesterday morning at around noon from my driveway. 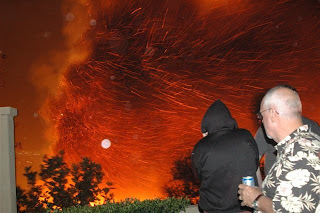 Here are some more dramatic photos that my friends from Portola Hills shared with me as they also went through a similar frightening experience Tuesday night as the Santiago fire made it's way across the canyon(Whiting Ranch) to their community. 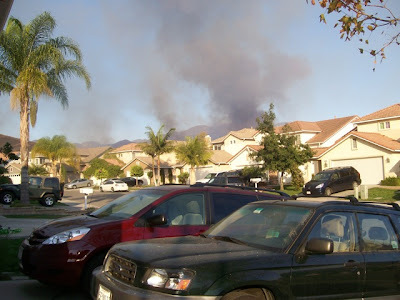 These are photos of the fire coming from that canyon and travelling up to the Portola Hills homes. 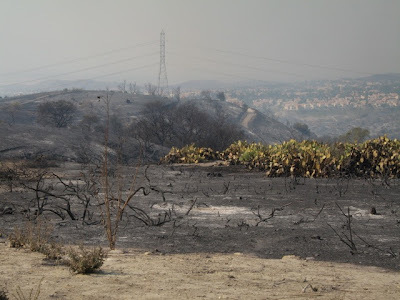 Here are some photos of the devastation to Whiting Ranch in the aftermath of the fire. The Santiago fire still burns and has now claimed some homes and structures in neighboring Modjeska Canyon. It's a little more rural there. 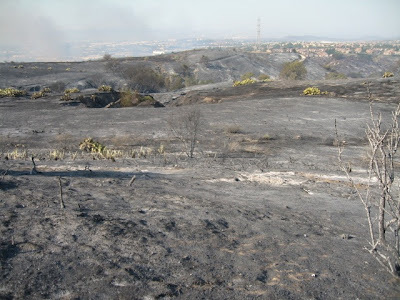 The developers of Foothill Ranch and Portola Hills really knew what they were doing in terms of building a community prepared for a potential fire disaster. There are natural firebreaks/walls that were designed to protect the homes. Our homes were good barriers for the firefighters, too, as they were able to gain access to fight the fires. There are lots of cacti planted around the homes. Praise God for not one single home in Foothill Ranch or Portola hills was lost....and our communities are very dense with homes. I feel for the folks down in the affected San Diego areas. Please keep them in your thoughts and prayers, too. School remains closed Thursday as the air is even worse now after several days of smoke. My neighbor works in a doctor's office and she was kind enough to get some face masks and gave them to us this evening as they are much in demand and you can't go anywhere around here to buy one. 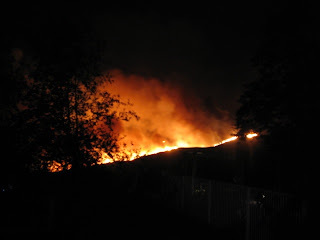 We can still the see the fire burning tonight over the hill from my daughter's bedroom. The air just reeks with the smell of the fire. The good news is that the weather is better Thursday and no more winds. They have been running water-dropping aircrafts all day and more tomorrow. I am so glad that all is well. You are all in my prayers! Those pictures are amazing. I am so glad you all are safe, and feel so badly those who have lost so much in this tragedy. Yay Daisy! I've been so worried about your home. I am so pleased that you made it through unscathed! 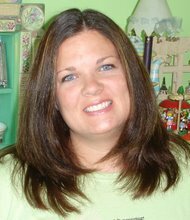 Your husband is a true hero and so are those firemen. Big hugs to all of you! Daisy, I'm so glad your neighborhood is ok now. (((hugs))) to you and your family!!! My niece and her husband lost their home to the fire in Running Springs 2 days ago. 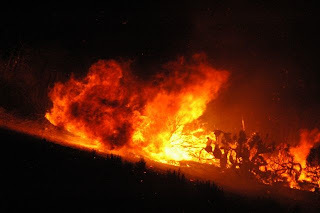 These fires have been a nightmare! I am so glad that you guys are safe. Those pictures are wow to say the least. You are all in my thoughts and prayers. Daisy and Joy..Please be safe...your families and both of you are in my prayers. Ahhhhhh, dear Daisy, David and girls .... It's so good to see your post ... even though I know the air quality is atrocious. It's good for the rest of us to "view" this disaster .. to fully respect it. And it's much better to know that you and yours have survived it ... and are strong and safely together.